You’ve passed the initial screening, your CV seems to fit, and you’re all set for your first face-to-face for your dream job. There are several steps to getting hired but the hurdle of the first interview is perhaps the most significant. 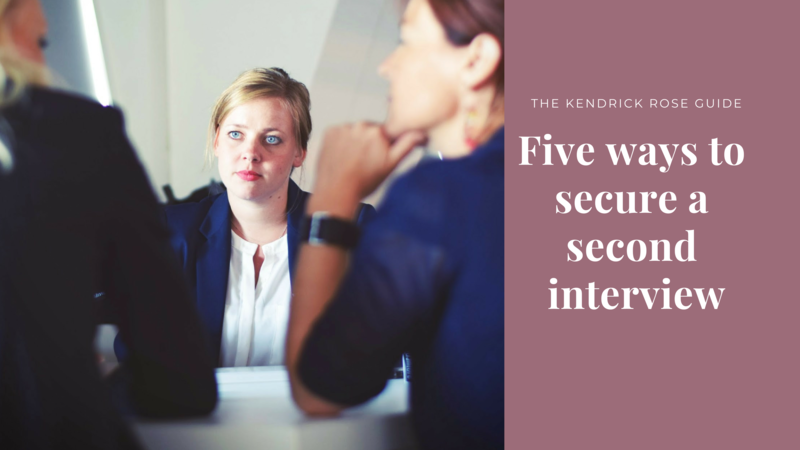 Shelley Kendrick, Managing Director, Kendrick Rose, said: “The first interview is an opportunity for a company to see if you match up to your CV and if you could be a good fit. It’s your opportunity to demonstrate your enthusiasm for the role and show what skills you have and how they could benefit the organisation. First impressions count, and interviewers make judgements within the first seven minutes that could go for or against you for the rest of the interview. Research by monster.co.uk found employers rank first impressions as the most important factor in making a hire after work experience (24% to 36%. Key factors for making a good first impression included timekeeping (96%), preparation for interview (93%), ability to hold eye contact (82%), and personal appearance (73%). If you think an interviewer gave you a hard time, you might have done better than you thought as difficult interviews can be the most successful. Research by Glassdoor found a 10% more difficult interview process was associated with 2.6% higher employee satisfaction. The optimal difficulty level of an interview for job satisfaction was four out of five, with five being the most difficult. If you’re nervous you might not feel like smiling but it should help you relax and make you seem more personable. Smiling causes a reflex reaction in people you’re with, encouraging them to smile too. This lightens the mood and makes everyone feel more comfortable. Failing to make eye contact with the interviewer also gives a negative impression – making it look like you’re insecure or deceptive. Focus on looking at the bridge of the nose if you find real eye contact too intense at first. The key time to look at someone is at the end of your sentence as this helps cement your message. Asking questions that help you get deeper into what the role is about or how the organisation operates helps show your interest. It’s good to be eager but not to look desperate. Research the company’s website, annual reports, and news articles to identify points you would like to know more about. A company’s social media can give you an idea about its CSR activities and team social activities to give you a better insight into the sort of people who might be your colleagues. An interview is a two-way process, you need to find out if the role is right for you, and if the corporate culture is right for you before you can persuade the organisation you are right for the role. It might be tempting to exaggerate your involvement in successful projects or big-up your experience, but if you over sell yourself you risk getting caught out. Know your CV well and think about how you will respond to questions about past achievements and areas where you are developing. Questions like ‘tell me about yourself’ are an invitation to talk about your education and career – practice so you can speak clearly and confidently. Employers might have a wish list of skills but if you demonstrate your willingness to build on the skills you have and undertake more training, you will come across as a more trust worthy candidate than someone making claims they can’t back up. Being overly critical of a past-employer or colleagues can create a negative impression and, in a small community, you might even be referring to someone the interviewer knows! Prospective employers will also wonder if you might speak about them badly in the future. It works the other way too. If an interviewer is critical of a person who you might be replacing, you should be wary. If you are asked a question which you find difficult to answer, take a breath and pause to calm yourself first and take any emotion out of your response. It goes without saying that you should research the role and company ahead of an interview. However, going a step further and identifying something that could be improved, and a way of improving it, or new projects that could help the company, will help you stand out. Whatever the role, employers are looking for people who are going to make their lives easier and demonstrating that you can take initiatives shows you have plenty to give. Do you feel like you need a little help brushing up your interview technique? At Kendrick Rose we offer bespoke masterclasses for candidates. It’s all part of our service. If you’re thinking of changing roles, register with us at https://www.kendrickrose.com/ to find out more.